You want to hear something crazy? 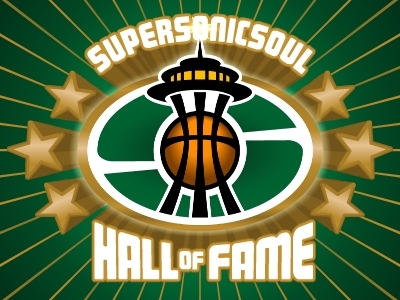 Tonight may be the last game ever played by the Seattle SuperSonics, and nobody - absolutely nobody – is talking about the game. The X-Man. Haywood. Lenny. Gus. DJ. Scheff. Vinny Askew. Clem Johnson. Dana Barros. Sam. Rashard. All gone – possibly - after tonight. Of course, that is far from a certainty. In fact, it’s about as likely as David Stern donating his next paycheck to Hamas, but it is certainly possible. One game left, one more time to hear, “And here’s the starting lineup for Seattle tonight ...” One final time to read a boxscore in the morning paper, one last time to check the standings. Well, that aspect of following the Sonics left town a few months, if not years ago, but you get my drift. Being a fan is more than celebrating the championships, it is following the day to day progress of young players, the possibilities of trades, the draft, the injuries. Being a fan is remembering how Gus Williams tied his shoes, or the way Xavier McDaniel took a fadeaway jumper, or grimacing at Detlef Schrempf’s mullet, or marvelling at Gary Payton’s ability to run backwards, tilt his head to the side, and talk smack. All of that goes into it. We remember the beautiful times of the early 90s when Shawn Kemp reigned supreme and anything was possible, or the ugly times of the past few years. It all goes into being a Sonic fan. And, tonight, it might all just end. Sonics. Warriors. Tip-off at 7:30. Let’s hope it won’t be the last. Well, 1 quarter is just about in the books for the final game of the season. Right now, Jo Petro is on his way to a quadruple double - isn't that one of the signs of the apocolypse? Anyone else having trouble finding this game on TV? I'm at my buddy's place and we've got the NBA League Pass and not even that is showing the game. Lot of good games on tonight--I'm guessing Sonics-GState isn't high up on the radar. That is one pretty box score. Who does Durantula think he is posting 40 points and 13 boards on 72% shooting in a completely statistically meaningless game? Green was a beast too, I love it. Well the future for this team looks really bright, whether in Seattle or Okieville. They better not leave dammit. I hate Clay "Aiken" Bennett more than Bin Laden right now. Someone on SonicsCentral.com mentioned to use this blog the next time SC.com got shut down by hackers or whatever (probably hired by Clay Bennett or David Stern). We've been having a lot of problems keeping it online. This is the third shutdown in 3 days. It went down sometime after midnight I believe, but well before 1:00AM. I'll keep trying it until I go to bed in 15 minutes. It's 1:06AM now 4-17-08. Do you guys also post on SC.com? I would hope people don't only come here when SC is down! Thanks for finding us, though. You'll find the sites are very different--SC is a great, straight-forward news site, and Supersonicsoul . 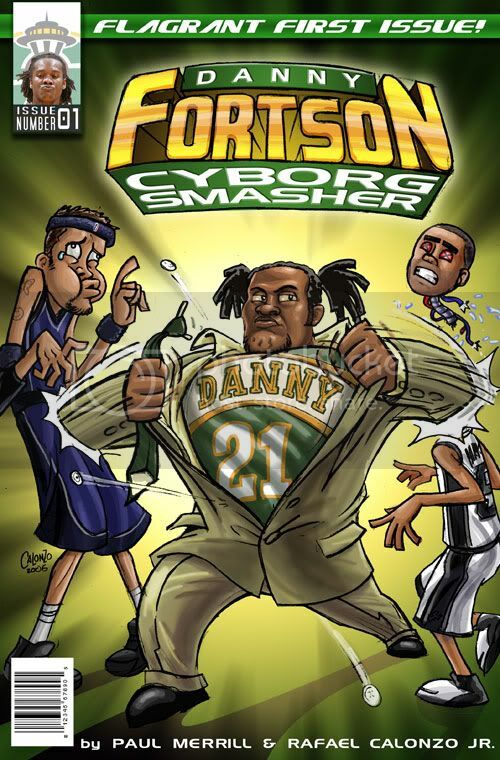 . . has cartoons about Danny Fortson. 'Nuff Said! Man, the game last night was awesome. I got several Warrior fans to yell "Save the Sonics" with my brother and I. Hell, we even found 10 other sonic fans with throw back Kemp and Payton jerseys. Man, if the Sonics go, then they went in high flyin', glory days like pizazz. My bro made a video clip of the last few minutes of the game. We'll post it to tube some time later today or tomorrow. Thanks, mcw. Send us a link and we'll put it up on the site. Isn't it amazing how the Sonics played in the last few games of the season? It's as if the tension from this move was finally lifted, and they just went out and played. Imagine what this team could be like next year with all the doubts removed.